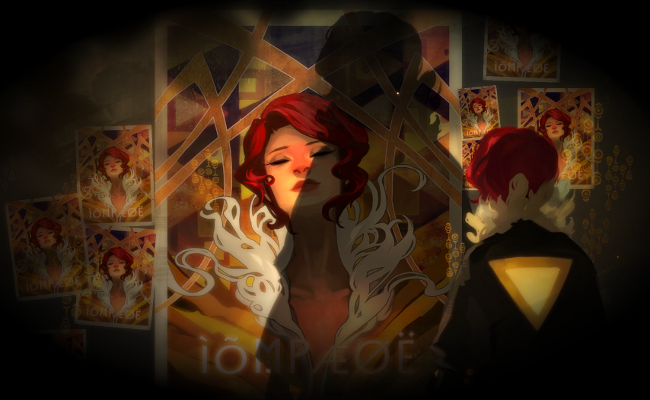 This post contains spoilers for Transistor. This week on PopMatters, I write my first (of what I imagine will be many) words on Transistor. It’s about how the theme of control is woven into the game’s story and its rules. Cloudbank’s populace can influence the construction of their city, but only within the narrowly defined voting choices given to them. The color of the sky doesn’t have much bearing on how the town is governed and even that choice is quickly undone by the next popular vote. The Camerata, seeking to install a benevolent system of autocracy, try to impose a united philosophy. This bid for control quickly unravels when the their own weapons turn against them. Finally the huge amount of customization that can be done to the combat system gives the player s sense of control over the game. For me at least, this feeling extended into feeling like I also had influence over the main character’s story arc. Because of this, Red’s final decision was a shock, both because I didn’t expect it and because I couldn’t influence it. This dynamic was one of the more surprising and subtle departures from Bastion. The Kid was a truly silent protagonist whose motivations were explained by narrator based on the actions you took. In the end, you had to directly choose from two options of how to end the game and the outcome was attributed directly to the Kid and, by extension, the player. In Transistor, Red is quiet for most of the game, but it’s because her voice was taken by the Camerata not because she was conceived as a cipher designed to be a direct stand in for the player’s personality. The Transistor sword itself feels like a narrator, but the ending is a sharp reminder that it is another character and its monologues were actually one-sided conversations. The end result for me was a realization that my sense of control was just as tenuous as the game’s characters. Transistor tells a story about the ebb and flow personal agency, the dynamics of which also encompass the person holding the controller.